If Dinan had told me! Property 7: If Dinan had told me! 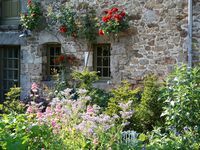 Property 22: House of Bézardais for 4 people in Dinan, Brittany, France. We stayed here for 4 nights in April. House was exactly as listed, only better! - old beams, cosy, unique collectors d&eacute;cor, circa 16th century maybe?! - larger than photos showed, would easily accommodate 4 adults. - central location off a small street near the cathedral and many restaurants. - modern, high-tech appliances including 3 coffee makers to choose from! - Underground parking and pass was a real bonus as much restricted parking in walled city. Owner took us there which was very useful. This is the most fully-equipped rental we&rsquo;ve stayed in: toiletries, kitchen supplies, welcome package of baguette, crepes, jams, milk, OJ &ndash; amazing! Despite being cooler weather the house was very warm and cosy. The bedding was beautiful and new. Very clean. 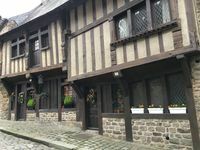 We looked as staying in Port of Dinan and St Malo, but we&rsquo;re extremely happy we chose Dinan and this eclectic property. The unique character of the home itself made it actually hard to leave some days - You are sitting in history itself! Would love to know the history of the house! Owner lives near by and was easily reachable. Merci beaucoup Bernard! The hosts were welcoming and very helpful. The beds and chairs were comfortable and the kitchen was well equipped. We enjoyed fires in the evenings, and were grateful for the washer and dryer. The outdoor seating area was lovely, and a neighborhood walk was fun- there were horses and goats nearby. We had a little trouble finding it as our GPS didn&rsquo;t accept the address, but we got there in the end and were delighted with what we found. I highly recommended this property!